Over the last few months we’ve discussed sliding patio doors and French doors and their various uses in your home. 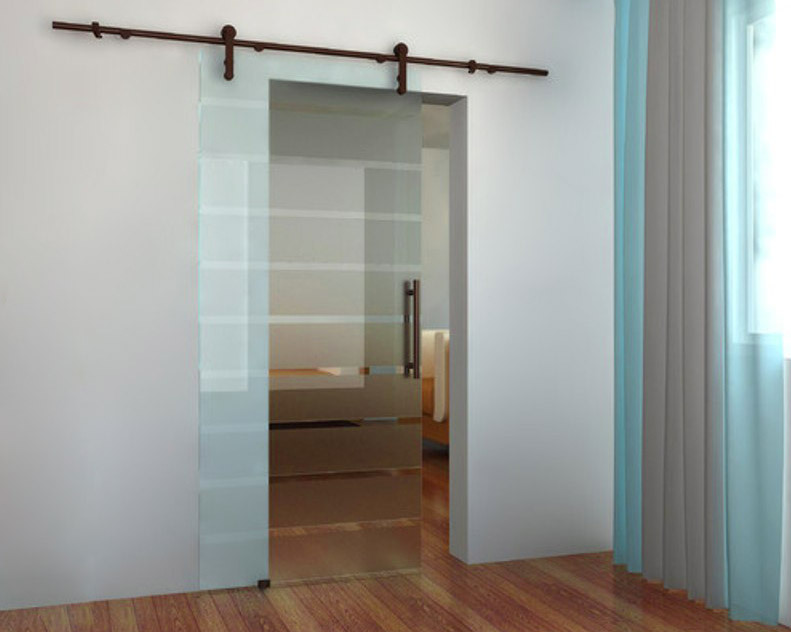 All-glass sliding doors are another innovative design option that is growing in popularity. If you’re familiar with the sliding barn doors from years ago, the concept is much the same. All-glass sliding doors are made from thick, heavy glass and attach to a decorative upper track with a trolley system. They are used to create smaller, functional spaces where families can gather or they can be left open to provide a sense of expansiveness. Much like interior French doors they are often used to set apart a dining room or home office from a larger space. However, unlike French doors, which require some remodeling and construction skills, all-glass sliding doors are surface mounted above an existing opening so you can create a distinct space with little effort. Traditional barn doors have 2 panels that slide open from the center. All-glass sliding doors are available in this configuration or in a single-slide set up. The high quality hardware comes with a “soft-close” feature to keep it from slamming closed or open depending on the direction. And, handles, pulls, or knobs are designed so they don’t hit the wall when the door is opened. Normally, the hardware has a brushed satin or chrome finish but there are many other finishes available to complement your tastes. Leaving the track and upper hardware exposed provides a more contemporary look while enclosing it with wood trim matches a more traditional style home. The architectural grade glass is usually 3/8” or ½” thick and is either tempered safety or laminated glass (like the windshield in your car) in case someone accidently runs into it. Choosing an etched or patterned glass, instead of clear, will provide a sense of privacy and elegance to your room. Glass will allow natural light to flow from one room into another as well, so you can have your privacy, yet still benefit from the natural light. All-glass sliding doors are strong, safe, and sophisticated design innovation that complement today’s modern homes.